10 months ago, when baby Muhammed Aslam was born to Shihab and his wife Surumi only two years into their marriage, the couple was elated. However, their happiness was short-lived. “Right from when we got him in our hands, he cried non-stop. He looked like he was in constant pain, but the doctors at Lakshmi Hospital in Kochi assured us that it is normal for newborns to cry and we didn’t pay much attention to it,” says Shihab, a salesman at a mobile shop in Ernakulam, Kerala. 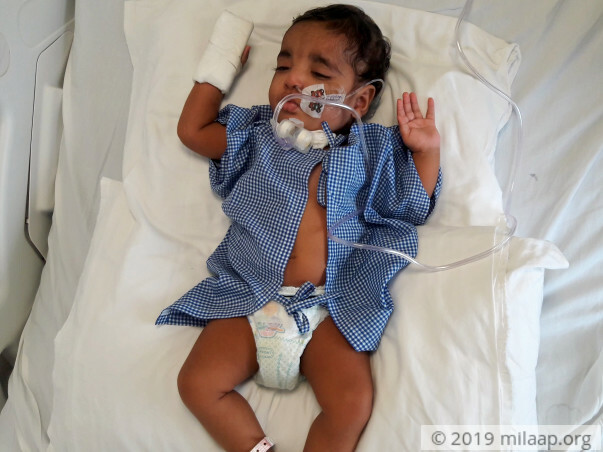 Shihab was not convinced as the baby had red spots all over his body too, which the doctors dismissed as a mere ‘infection’ and put the baby on antibiotics for seven days. “The antibiotics did little to reduce the redness. So, we opted for a homeopathic treatment after taking him home and that is when the spots went away,” he adds. The real problem started when baby Aslam, all of 45 days then, was taken to the hospital for his first vaccination. 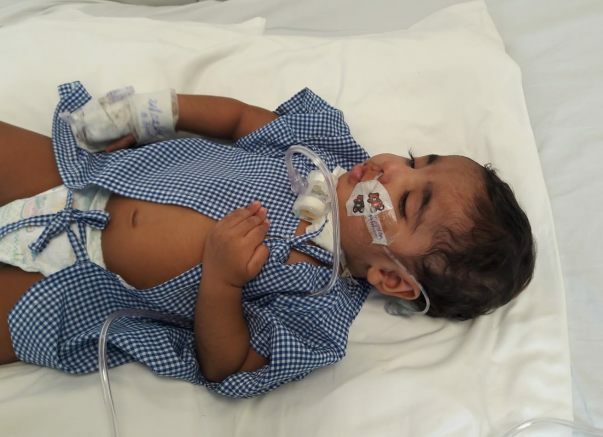 “The doctor said that Aslam cannot be vaccinated as he had phlegm in his lungs. He said that he feared it could be pneumonia and referred us to another doctor in the city. Aslam was constantly crying at this point. When we took him to the new doctor, he was immediately admitted to the NICU, and stayed there under observation for 14 days. The hospital bill amounted to almost Rs 48,000. I had spent almost all my savings paying it. However, the doctors discharged him after administering the routine vaccine along with a pneumonia vaccine. I thought everything was going to be fine,” Shihab recalls. A week later, things totally spiralled out of control. “One day, while breastfeeding the baby, my wife noticed that the baby suddenly became motionless and his face turned blue. I rushed him to the hospital where he was put under observation for the next two days.” And after a change of hospitals and a string of tests, which included an MRI, it was found that Aslam had Arnold-Chiari malformation, where a part of his brain extended down to the spinal cord, which was the main cause of distress and pain. 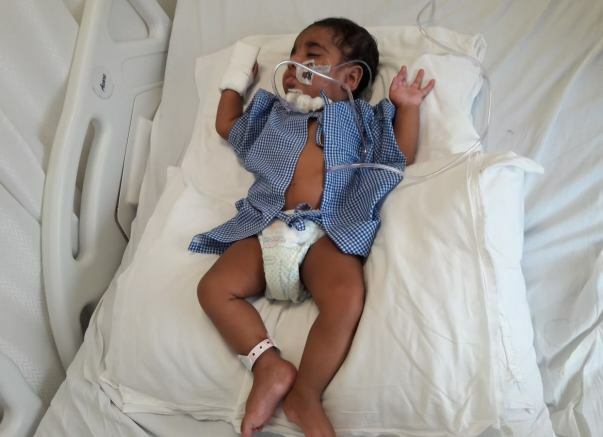 So, when Aslam turned 4 months old, he had a surgery and he lay in the ICU for about 58 days. “Though it cost me a whopping 7.50 lakh rupees, I thought this surgery would solve all his problems but the same problem reappeared after a week. At this point, the doctor told us that it is because of fits and there is no treatment except medicines for managing it to a certain extent,” says Shihab. The doctor also suggested doing a genetic test – the results of which said that he would struggle with respiratory problems like wheezing all his life. “Our hearts sank. Aslam was grappling with severe chest congestion and his crying spells intensified. We discovered that Aslam had trouble breathing because the food was getting regurgitated and he needed a fundoplication (where a false sphincter is made between the stomach and food pipe) to help him swallow. We did not want to go ahead with this because we were afraid he would not make it,” he shares. Meanwhile Aslam had a tracheostomy to keep breathing. The poor baby had to be fed through a tube and lay in the hospital for 58 days. “Because of the tubes that covered his nose, his lungs would fill with phlegm that had to be removed many times in a single day using suction. A single suction tube costs Rs 450. Till now, we have spent Rs 14 lakh on my baby’s treatment. My monthly income is only Rs 13,000 but I have not gone to work since June last year and made most of the money selling my wife’s ornaments. Many good Samaritans helped us as well. But now I have a staggering loan of about 7.50 lakh rupees. My father is a heart patient and mother is a diabetic, so there is nobody to take care of my child except his mother and I. I do not want to go ahead with the fundoplication surgery because I do not want to lose my son,” Shihab laments. This young father does not want to lose his son at any cost and needs your help save 10-month-old Aslam. We have some unfortunate news to share with you. Muhammed Aslam passed away. His parents are devastated. This tough brave kid had fought very hard, however, succumbed to infections and could not make it. The funds will be utilized for his medical expenses. Please do pray that the family finds strength in this time of need and thank you for all the love and support you have shown this little one. 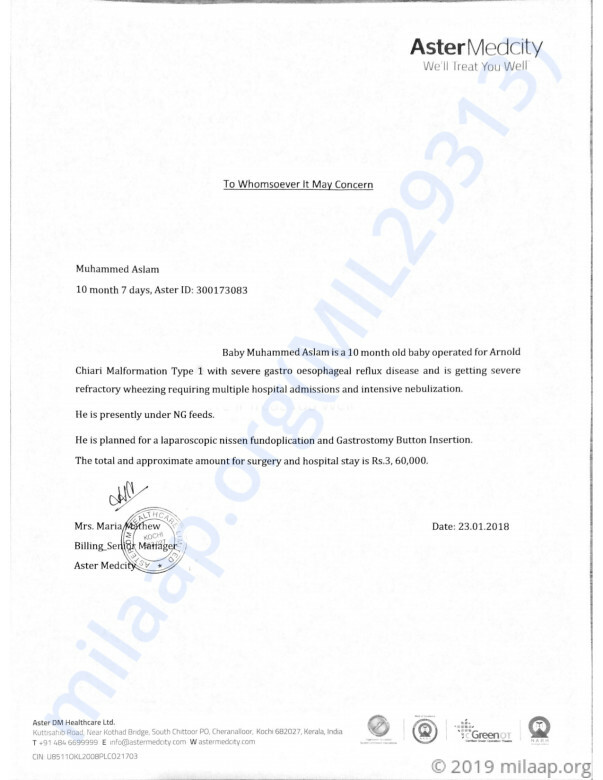 Your timely support ensured that he received the best medical care.